In this warm collection of personal essays and recipes, bestselling author Ann Hood nourishes both our bodies and our souls. From her Italian American childhood through singlehood, raising and feeding a growing family, divorce, and a new marriage to food writer Michael Ruhlman, Ann Hood has long appreciated the power of a good meal. Growing up, she tasted love in her grandmother’s tomato sauce and dreamed of her mother’s special-occasion Fancy Lady Sandwiches. Later, the kitchen became the heart of Hood’s own home. She cooked pork roast to warm her first apartment, used two cups of dried basil for her first attempt at making pesto, taught her children how to make their favorite potatoes, found hope in her daughter’s omelet after a divorce, and fell in love again --- with both her husband and his foolproof chicken stock. 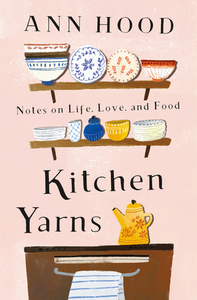 Hood tracks her lifelong journey in the kitchen with 27 heartfelt essays, each accompanied by a recipe (or a few). In “Carbonara Quest,” searching for the perfect spaghetti helped her cope with lonely nights as a flight attendant. In the award-winning essay “The Golden Silver Palate,” she recounts the history of her fail-safe dinner party recipe for Chicken Marbella --- and how it did fail her when she was falling in love. Hood’s simple, comforting recipes also include her mother’s famous meatballs, hearty Italian Beef Stew, classic Indiana Fried Chicken, the perfect grilled cheese, and a deliciously summery peach pie. - Visit Ann Hood's website and blog. - Connect with Ann Hood on Facebook, Twitter and Instagram. by 11:59am ET on Friday, October 19th. This is a special newsletter for our Fall Preview Contests, which will mail on select days through Thursday, October 18th. This newsletter is separate from our weekly Bookreporter.com newsletter, which mails every Friday. You can subscribe to that newsletter here.